Genre: Young Adult (YA), Science Fiction, Romance, Fantasy, Apocalyptic. Anna Covey is a 'Surplus'. She should not have been born. In a a society where ageing is no longer feared, and death is no longer an inevitability, children are an abomination.Like all Surpluses, Anna is living in a Surplus Hall and learning how to make amends for the selfish act her parents committed in having her. She is quietly accepting her fate until, one day, a new inmate arrives. Anna's life is thrown into chaos. But is she brave enough to believe this mysterious boy?A tense and utterly compelling story about a society behind a wall, and the way in which two young people seize the chance to break free.-summary from Goodreads. Sixteen year old Anna Covey lives in the brutal, brain-washing Surplus Hall. A home – if you can call it that – for unwanted children. Children that should not have been born. Children, that in the eyes of the rest of the world, are unclean, and a disgrace to everyone else. In a world where no-one has to die of diseases and old age, Anna is one of many outcasts of society. As a result of Longevity, the drug that gives everyone the chance to live forever, no-one is allowed children. Instead, you have to live a dark and monotonous life in exchange for Longevity drugs, although you still age physically. For Anna Covey, or Surplus Anna as she is know by, life is harsh and unforgiving. As a child who shouldn’t exist, there is no pleasure, and her only aim and goals are to learn how to become a ‘Valuable Asset’, and to ‘Redeem Her Parent’s Sins’. Anna’s character was, I have to admit, annoying at times. All she seemed to talk about was how lucky she was to be at Surplus Hall, even when It was plain obvious to the reader that she wasn’t. As the book went on I came to accept her as who she was though. Her thoughts, however boring and pathetically docile made her more realistic and showed me how much the government and all the people around her had succeeded in brainwashing her, and making her entire life what they wanted it to be. They had managed to construct a near robot out of her just by continuously telling her what they wanted her to believe. To be honest I felt sorry for her. Sometimes I just wanted to shake her and yell at her to get a grip and see how everyone had pulled the wool over her eyes but I knew it wasn’t really her fault. You can only know what you’ve been told. And if you’ve learnt ever since you were young that your parents were dead, they were evil and were responsible for giving her a life like she was living, what would stop you believing it? In Anna’s case this was Peter. The strange boy who came to Surplus Hall at ‘late age’ and proceeded to turn her world upside down; telling her things she couldn’t possibly imagine to be true. Peter was a breath of fresh air for me. Finally, someone who could see sense! It was part of his upbringing though, he had lived on the outside so he knew things Anna didn’t. Peter was everything Anna - at first - wasn’t: Stubborn. Determined. Fierce. Reckless and he sparked the real Anna to come out of her shell. The one that had been hiding somewhere all her life but hadn’t been strong enough to come out. One thing I was very relieved to see was how romance wasn’t the main focus. It hung on the sidelines cropping up in little moments ever now and then as Peter and Anna’s friendship grew and as a result, I didn’t dread those times, because it wasn’t constantly being brought into the forefront of everything. It had its own little place in the story. 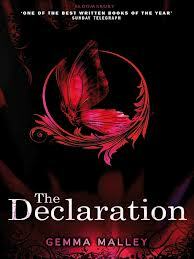 The Declaration holds a dark and oppressive world within its pages which is all too frighteningly foreseeable for my liking. Malley’s book offers a glimpse into what the world could turn into sometime in the future for ‘Surpluses’ and ‘Legals’, with a shocking result at the end. *this book was received in exchange for an honest review. this sounds very good! :) sorry I haven't visited in a while, I took a break from blogging, but I'm back!